This trip includes the Cuzco Festival of ‘Lord of the Earthquakes,’ Andean highland textile villages, exquisite cuisine, Machu Picchu, and beautiful, colonial Cuzco. 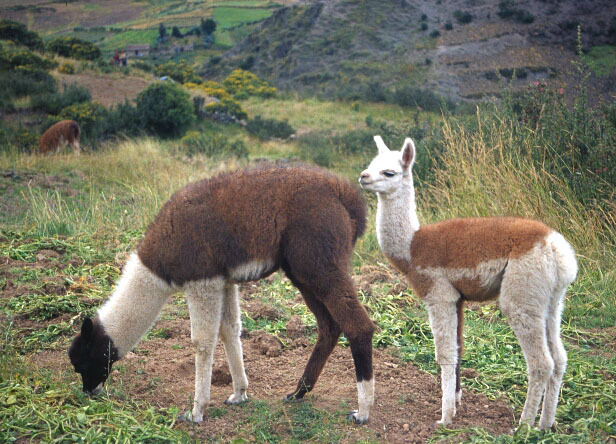 • See the spectacular ‘Lord of the Earthquakes’ festival in Cuzco. 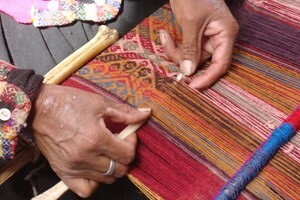 • Visit textile villages to meet the knitters and weavers, dyers and spinners. • Dine in some of Peru’s most celebrated restaurants. • Cooking class and Pisco-tasting in a private home in Miraflores. 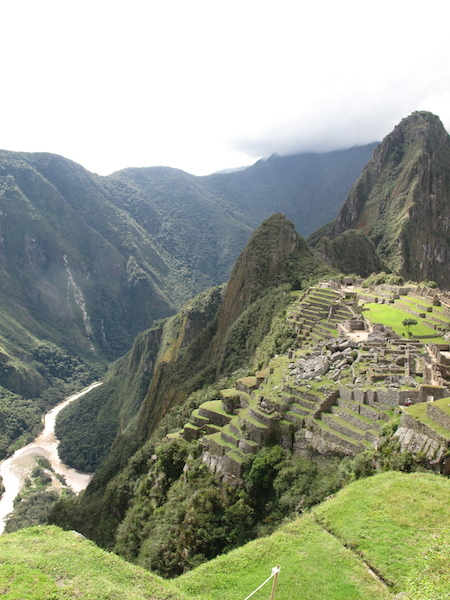 • Thrill to Machu Picchu’s Inca engineering marvels. • Savor a traditional village lunch with a local family. 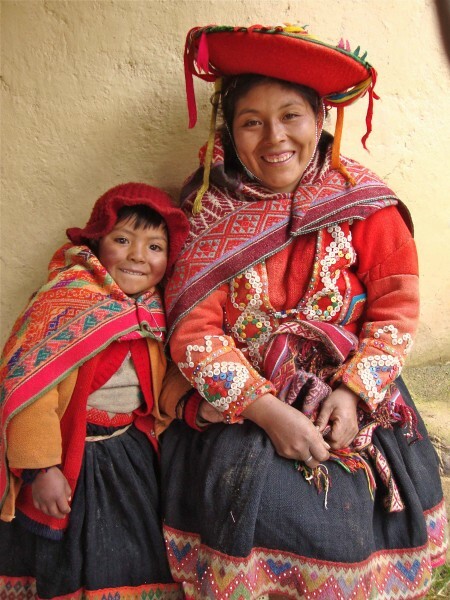 • Learn about ancient Peru at excellent museums. and Photo BOOK documenting the trip. 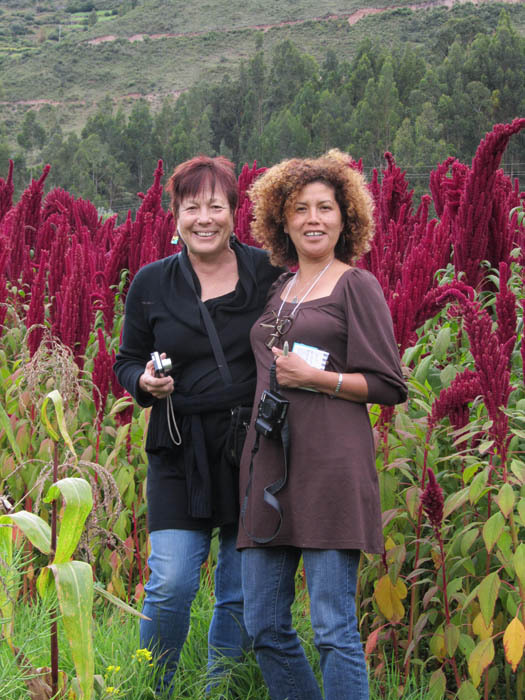 This adventure is organized and led by Cynthia LeCount Samaké (Andean knitting/textile expert with over 30 years travel experience in Peru) and Peruvian, Veronica Samanez from Miraflores, Lima. Cynthia (or the hotel driver if after 10 pm.) will meet you at the Lima airport, upon arrival, on March 10. Check into the Hotel El Patio, below, for a good night’s sleep in this charming and cozy place that is overflowing with flowers and greenery, in the upscale Miraflores neighborhood. In the morning, we’ll all meet at breakfast in the hotel’s downstairs breakfast room. A friendly money-changer will come to the hotel lobby to change our dollar bills to soles, the Peruvian currency. Cynthia will hand out currency conversion charts to use until you get used to the money exchange. The van driver will pick us up at the hotel to begin our adventure in Lima, Peru’s bustling and prosperous capital city. 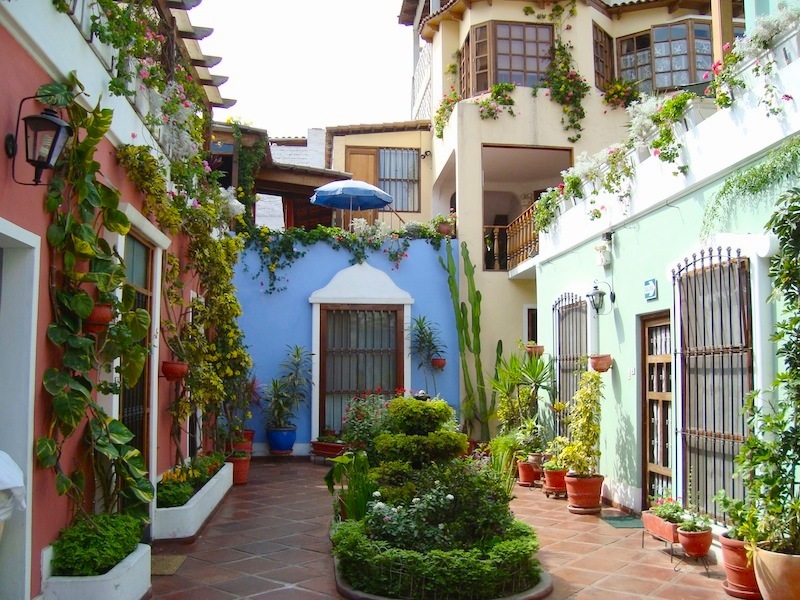 Lima has world-class museums, flowery parks, and interesting architecture. We’ll spend a very full first day in Lima, seeing the wonderful ceramic and textile collections of the fabulous Rafael Larco Herrera Museum, housed in a beautiful old mansion with flowery gardens. It has been renovated recently, and the presentations are superb, but we still love the old storage section with the floor to ceiling glass shelves of Moche ceramics, like a huge library of pots, all carefully arranged and grouped by subject, crab pots, squash-shaped pots, llama pots, etc. After lunch, we’ll go to the private Amano Museum which has some of the world’s best textile collections–drawers and drawers of amazing pieces. Our Welcome Dinner will be tonight at one of Lima’s many excellent restaurants. 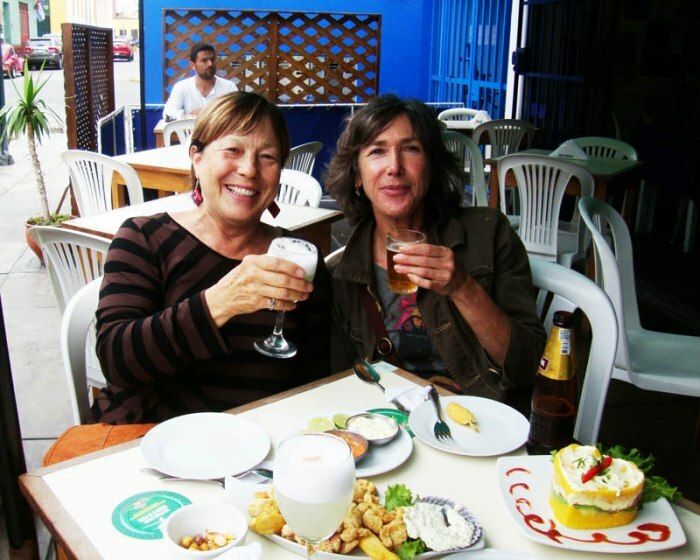 Cynthia and Veronica toast over a plate of causa. Next few days in Lima we’ll see the fascinating adobe pre-Inca ruins south of town called Pachacamac, and the huge pyramid right in downtown called Huaca Pucllana. We’ll visit overflowing local produce and food markets where Limeños shop for everything from purple potatoes and cocoa pods to exotic cheeses and meats. In Lima, we’ll have a Pisco-tasting and cooking class at a private home in Miraflores. And in our restaurant forays, you will be able to decide what dishes to order. Adventurous meat eaters can try new and surprisingly delicious dishes such as herb-stuffed guinea pig or grilled alpaca, or old favorites like Pollo a la Brasa, grilled chicken. 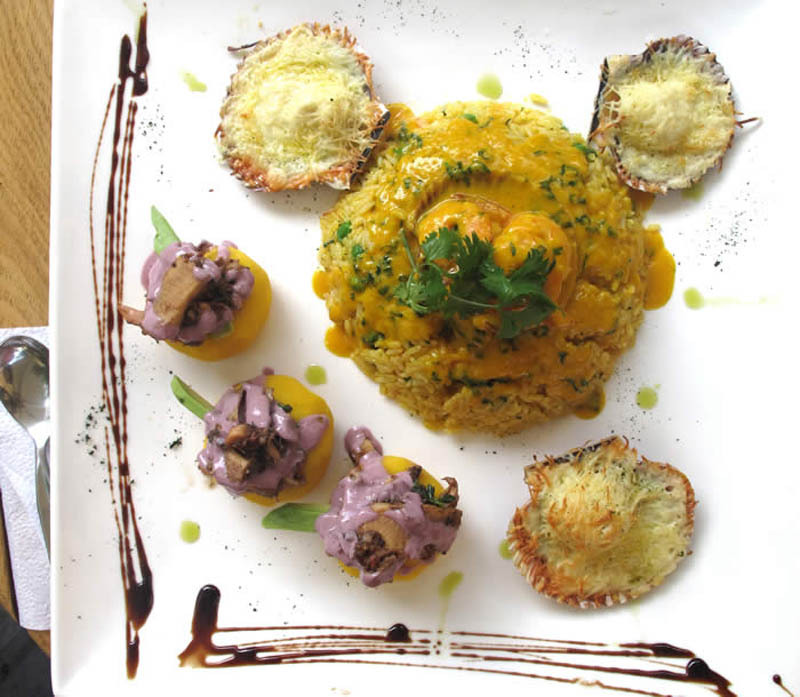 Peru has a lively restaurant scene with internationally known chefs. In both Lima and Cuzco, we will dine in some of the oldest and most famous, as well as some of the newest and hippest places. 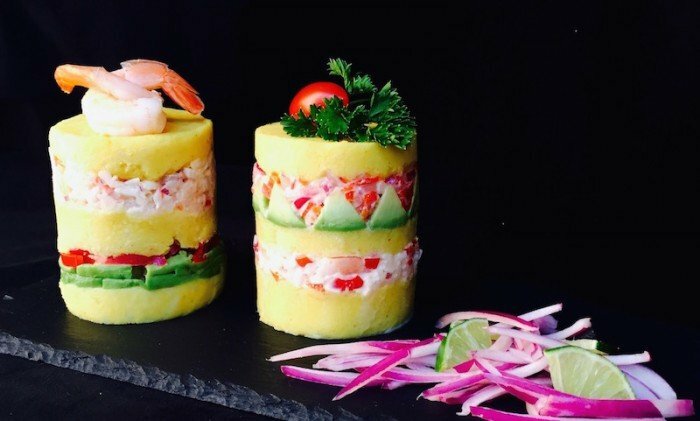 Seafood lovers flock to Lima for the tender lime-drenched ceviche, paired with a savory yellow potato causa layered with a mixture of crab or tuna; below. The list is endless! 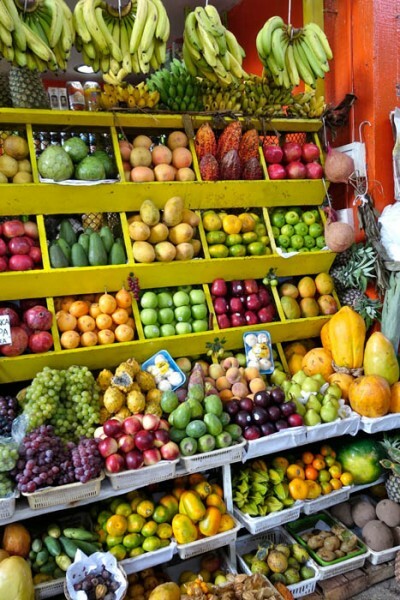 Cuisine differs markedly from Trujillo in the north, to Arequipa in the south, and from dry coastal Lima to the verdant Amazon region– with many fusion elements in between. We’ll sample foods from the jungle to the highlands, and from the desert to the coast. Next we will fly over the Andes to beautiful Cuzco, 1 hour flight. 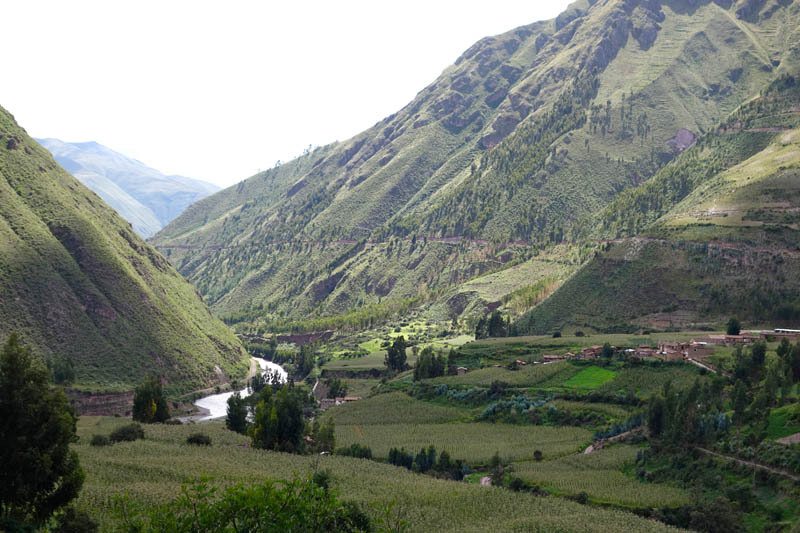 Then we will drive directly down to the Sacred Valley at lower altitude which will help us to acclimate. Relax at the hotel and the next day we’ll board the train for a ride through beautiful scenery to Machu Picchu National Park (UNESCO Cultural Heritage site). 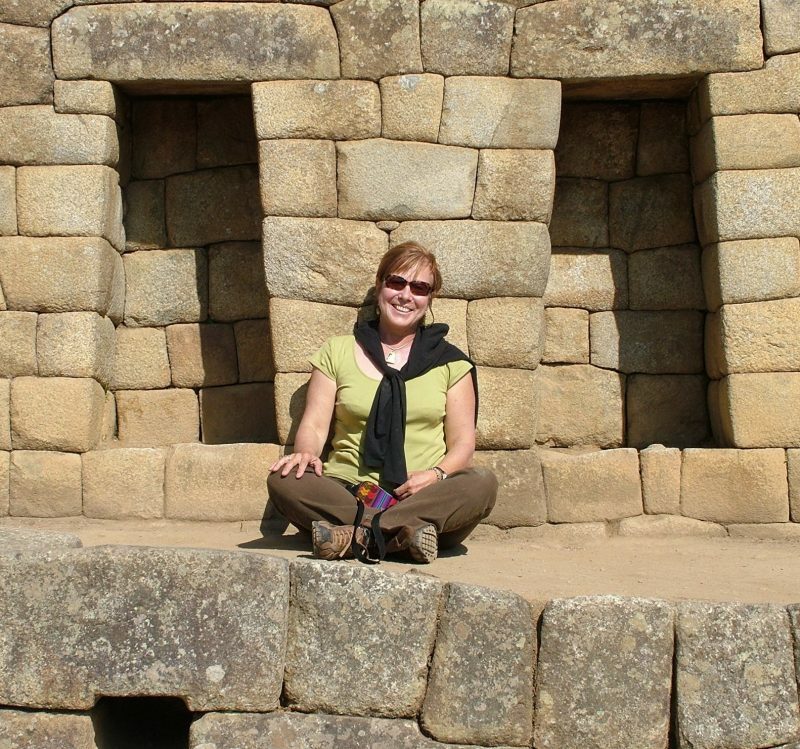 We’ll visit the magical place with a professional English-speaking guide, then have free time in the ruins; overnight in Machu Picchu Village. The climb to Huayna Picchu is easier than it looks, because there are steps the whole way, and even a firmly attached chain to hang onto, on the steepest part. I have climbed it 3-4 times, and the view is absolutely spectacular from the top! Climbing up to the Gate of the Sun gives a similar breathtaking view. 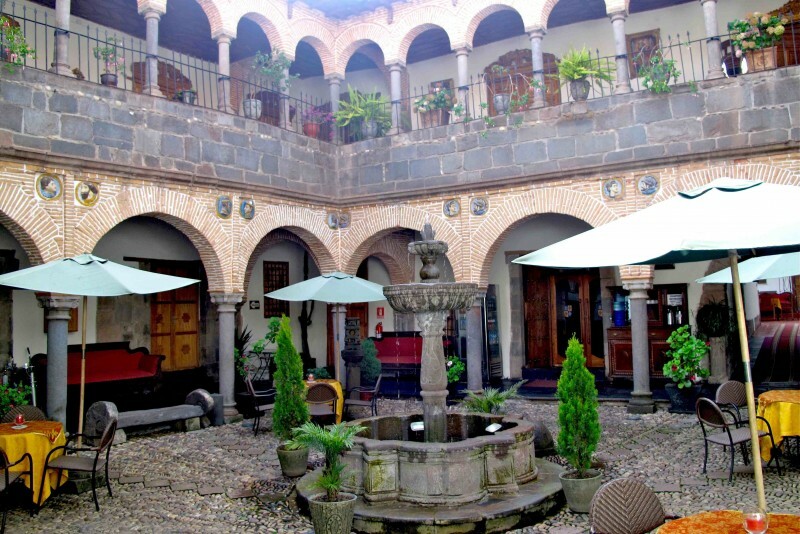 Take the VistaDome train back to Cuzco in the afternoon and check in to our centrally-located and heritage building hotel, right. Eat lunch then stroll around city to acclimate. 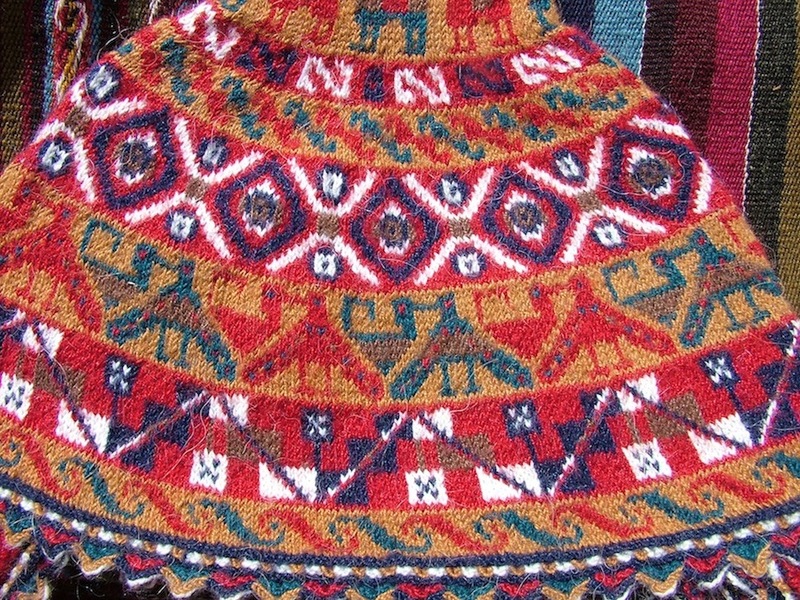 We’ll stroll downhill to visit Nilda Callanaupa’s excellent Museum at Center for Traditional Textiles of Cuzco, CTTC. 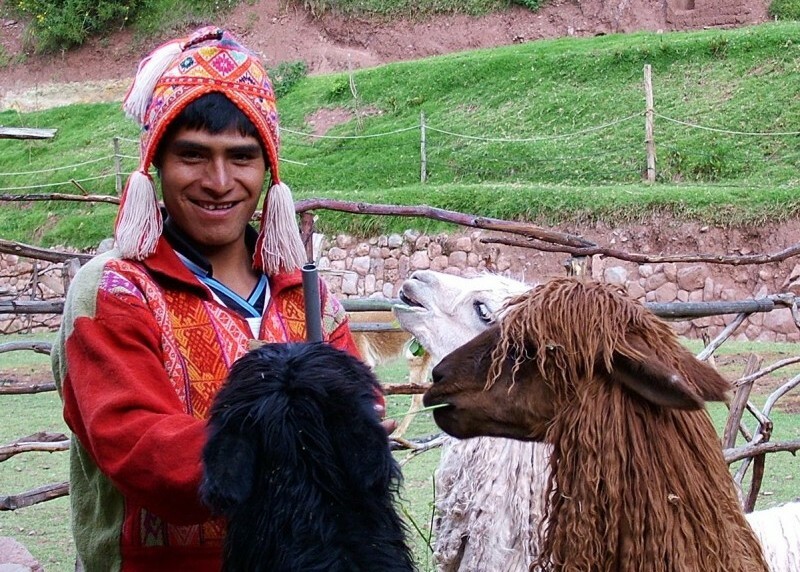 Buy white alpaca yarn from the Michell alpaca shop, around the corner from the hotel, for dyeing later in our workshop. 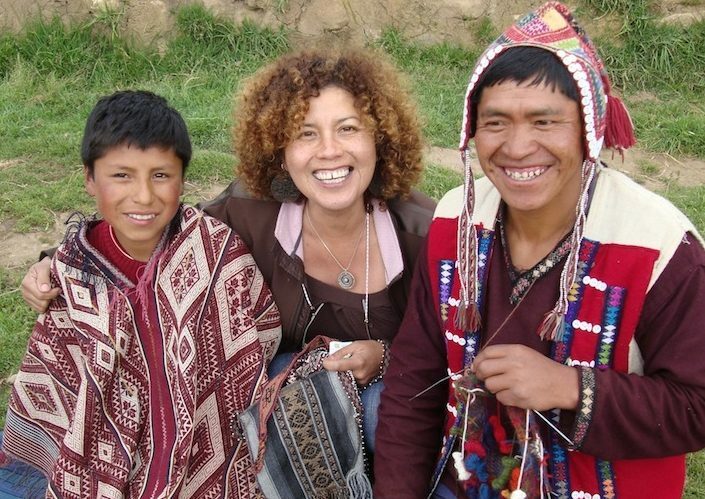 In the next few days we will drive through beautiful rolling hills of quinua and potato fields, into the highlands to several Andean villages to meet good friends who are amazing knitters and weavers. Picnic lunch in the Pitumarka weaving compound one day, and visit the famous little Andahuaylilas church with its ornate painted ceiling and altar from the 16th C.
In another village high above Cuzco, we will watch other knitters and weavers (every village uses different techniques and motifs for their textiles), then share a traditional lunch of soup and boiled corn with indigenous Quechua speaking friends living there. 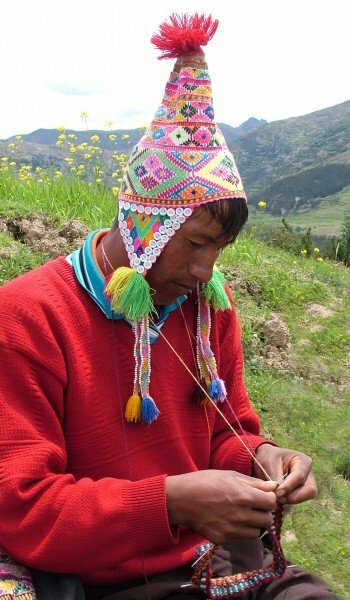 We will also see traditional Andean foods growing in the fields, such as red amaranth, quinua and quiwicha, native potato varieties, fava and lupine beans, and we’ll try various dishes incorporating them at our village lunch. 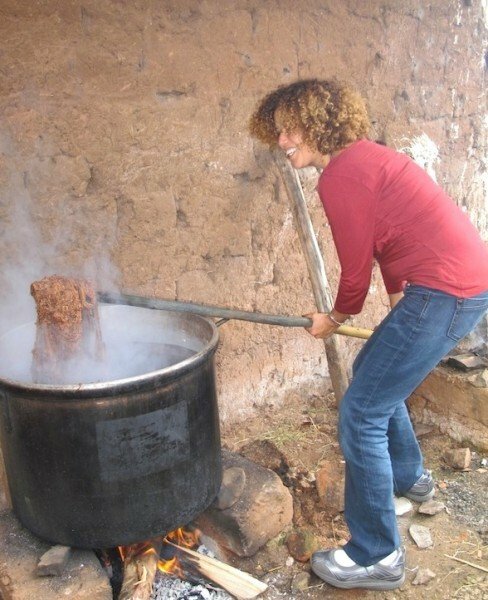 We will have a half-day natural dye workshop with the ladies in one village. Color your white alpaca yarn with cochineal, one of their favorite dyes, or another choice from their supply of flowers, leaves and lichen that make their rich colors. 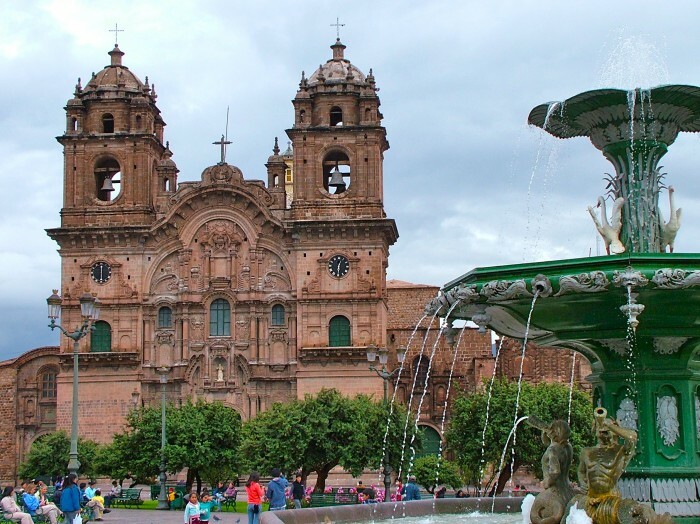 In Cuzco we’ll peek into the Cathedral to see the famous ‘Last Supper with Guinea Pig’ tableau, continue across the Plaza de Armas, to the street of the 12-angled stone, one fabulous stone in a whole foundation of amazing stonework walls. Walk back down and have American food for lunch at Jack’s, just in case anyone is feeling homesick! Later, walk down Triunfo Street, visiting favorite jewelers, and the suede/textile bootmaker. Before the festival, there will be time to see Sacsahuayman, the spectacular Inka fortress /ceremonial site above Cuzco. Sacsahuayman is known for amazingly huge stones fitted into zigzag walls, set around a grassy central area. We eat lunch in a restaurant (a friendly place where we go annually) overlooking the main Plaza de Armas, where the statue passes below, and we will have a basket of the traditional red flowers to toss down from the balconies onto the passing statue in the procession–for good luck! You can get some amazing photos by shooting from the restaurant vantage point on the balcony. Once the statue passes below the restaurant, the procession continues to 3 or 4 other churches where the statue’s loincloth is changed in each. The festival is very exciting because of the large numbers of people participating, and the huge and very heavy black Christ statue being carried by over 40 men, who change off every 1/2 block or so to allow another group the honor. The Lord of the Earthquakes is an important religious event for the people of Cuzco. At the end of the trip, we fly back to Lima and connect with flights for home. Details on suggested flights to come. • Pisco-tasting and cooking class in private home in Miraflores. • Photo and recipe book documenting your cooking class and journey! International airfare, alcoholic beverages, personal items such as laundry and internet costs (most hotels now have free wi-fi), second day entrance and shuttle to Machu Picchu, entrance fee to climb Huayna Picchu.